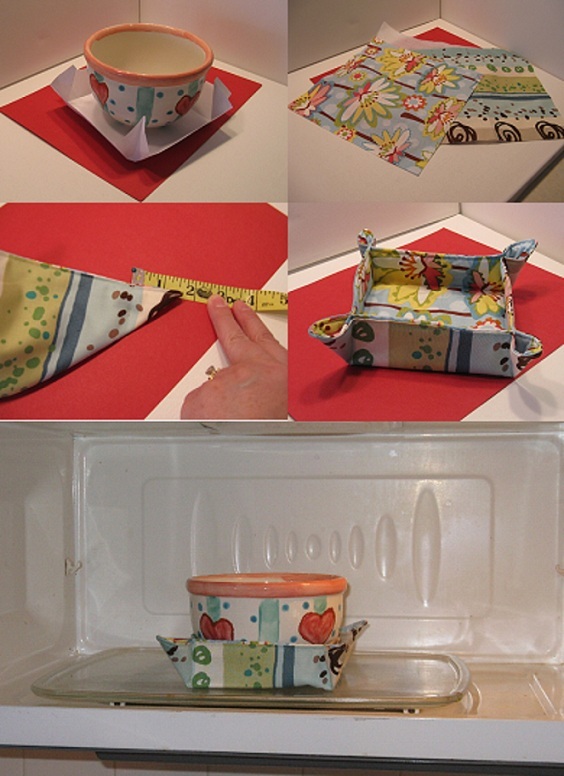 With a sheet of paper I took one of my bowls that I use in the microwave and decided how big I wanted the finished holder to be. I came up with 8 1/2 inches allowing for a 1 1/2 inch fold for the sides. This is pretty easy to do. I am not the best cane maker, but I keep trying. 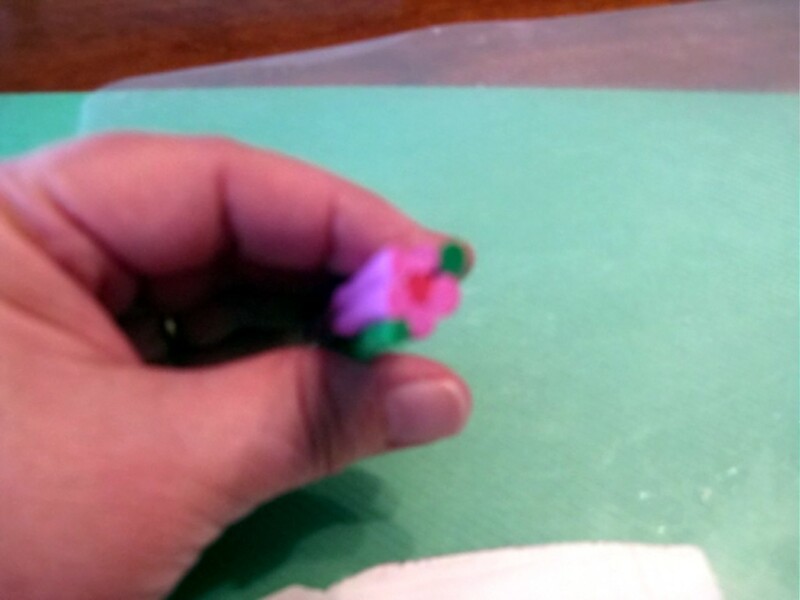 We are going to make a flower cane. You need one red, 2 green, and 5 pink snakes of clay. Mine are about 5 inches long and ¼ inch in diameter. Then a thin sheet of white about 5 inches long and wide enough to wrap around all the snakes when we get them stacked. Each snake is about the size of a small marble. To stack start with the red snake, that is the middle of the flower. Take the five pink and stack them around the red. You can gently push them together, but not too hard. The two green snakes will be the leaves, so put them where you feel the leaves would belong. 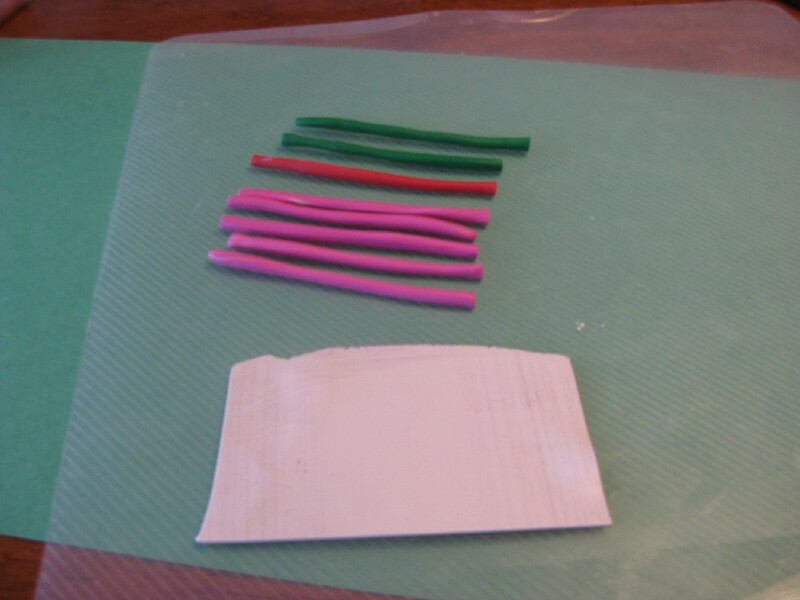 I used a pasta machine to roll out the white sheet, but you could use a piece of dowel to roll out the clay. The white clay was about the size of a small bouncy ball. 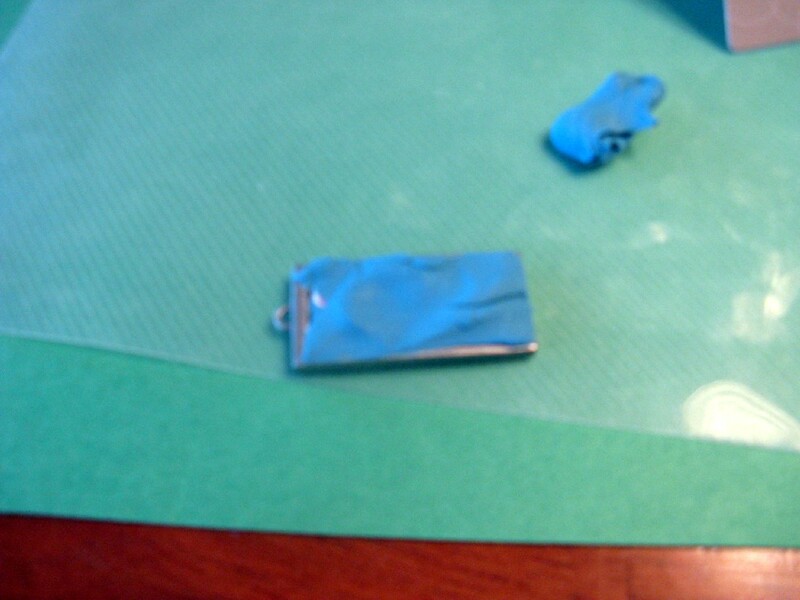 Using a flat blade, make one edge of the white sheet a straight cut. Now wrap the white sheet around the outside. Cut off the extra clay. Do not over-lap the edges. Smooth the seam with your finger until it disappears. Now you can manipulate the cane to the size you need. 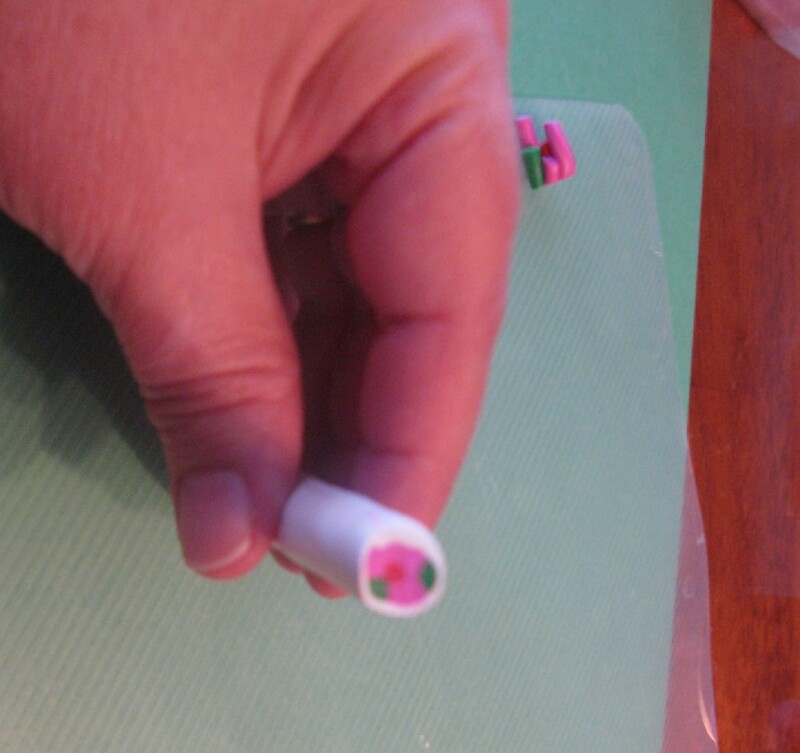 If you want it smaller gently roll with the tips of your fingers until you reach the diameter you want. If you want it thicker you can push at both ends until you reach the thickness you want. Approach gently so that you don’t distort the cane. Make small even slices from you can. 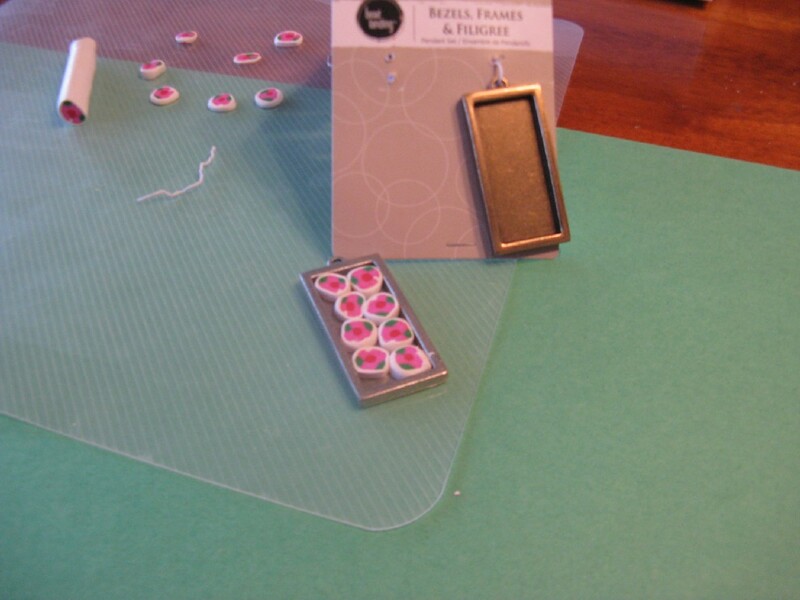 Fit them on a jewelry bezel and bake according to the package directions. You will have gaps where there is no clay, you want this. When it is out of the oven and cool to touch take the blue clay and smear it all over the top working into the gaps. 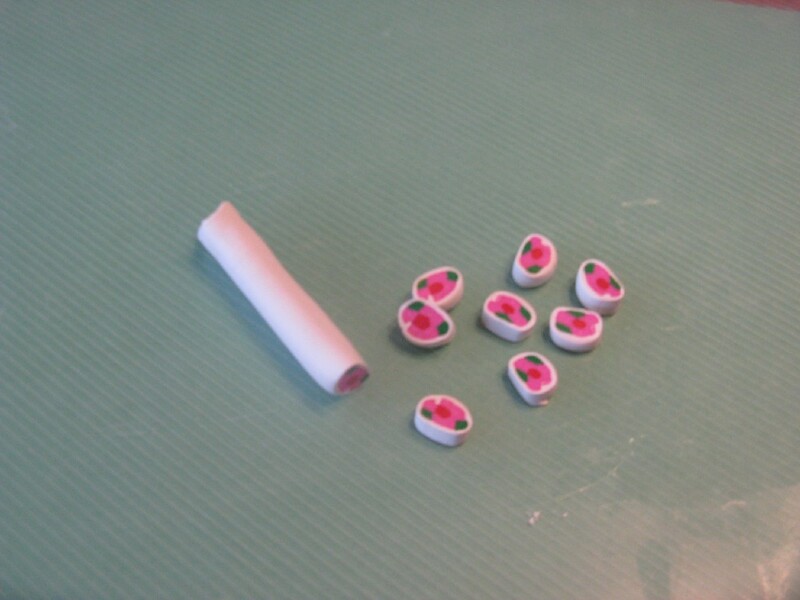 (Similar to grouting tile) Now wipe off the extra clay and expose your cane. You can use a paper towel to get the extra clay off. If you find a hole just add more clay. Once you are happy with the results back in the oven it goes and bake again about the same amount of time as the first baking. 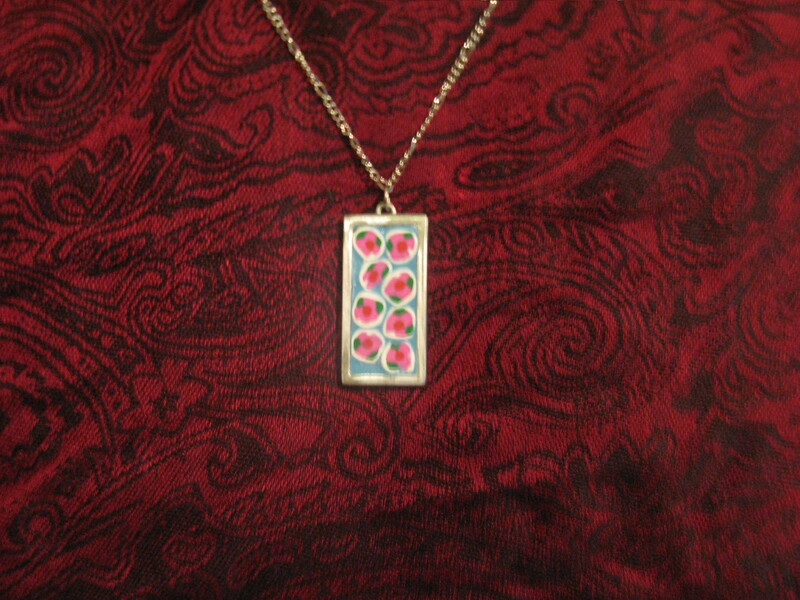 I like a shiny finish so I used a coat of varnish on the clay, added a chain and it is ready to wear.